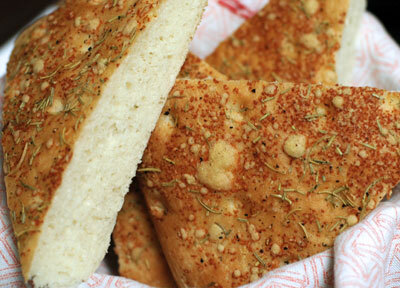 This focaccia is a breeze to make and comes out soft and chewy on the inside with a crispy top. From start to finish it takes under 2 hours. I used instant yeast, which can be mixed directly into the flour and makes the dough preparation quicker, but I’m not 100% thrilled with the flavor of that yeast. Next time, I’ll try active dry yeast and see if that improves the recipe. Regardless of the yeast, this bread was yummy and gone in two days. Can’t go too far wrong with rosemary, pepper and grana padano! Mix together the flours, salt, sugar and yeast. Stir in the warm water to activate the yeast. Add the olive oil and continue stirring to incorporate all of the flour. Knead on a floured surface until the dough is smooth but still quite soft, maybe 4 or 5 minutes. Put the dough in a lightly oiled bowl, turning to coat the dough with oil. Allow to rise, covered with a cloth, for 30-45 minutes or until doubled. Punch down the dough. On a large oiled baking sheet, flatten the dough into a large disc about 1 cm thick. Spread with about a half tablespoon of oil. Use a rounded spoon handle (or a large cooking chopstick) to dent the dough all over at 3 cm intervals. Sprinkle with rosemary, pepper and cheese. Sit a shallow pan of hot water in a cold oven. Put the bread pan on a shelf above the water. Close the oven and allow to rise about 20 minutes, or until doubled. Turn the oven on to 190C/375F and bake for 20 minutes or until browned on top. Cool on a wire rack. Tara’s been asking me to make some focaccia for a long time. I’ll try this as soon as I get time. Looks yummy. I took one of these to a gathering of shakuhachi and koto students. I could even claim a Japan connection! The family liked it too.